So, I've never been much of a skincare addict. Don't get me wrong, I do care about my skin and I do try out different products every now and then. But you know how they say that the general rule of thumb for skincare is "Find something that works and stick with it"? Yes, that's me. I've always used Cetaphil cleanser and moisturisers; sometimes, alternating that with a cleansing wash from Simple and moisturiser from Clinique For Men. Those few products have worked for me thus far. And because my skin is prone to breakouts, I always try not to stress it by trying out too many things over a short period of time. But most of all, I'm just very lazy. And while I've read about serums and the likes, I've never actually been compelled enough to try them - anti-aging or not. My two biggest vices, which I know are bad for my skin, are smoking and not drinking enough water. So, I think I'm pretty blessed with generally good skin that has not yet shown signs of aging (I'm also 32 years old and ... a guy) despite the two vices and often being out in the harsh sun and heat of Singapore. 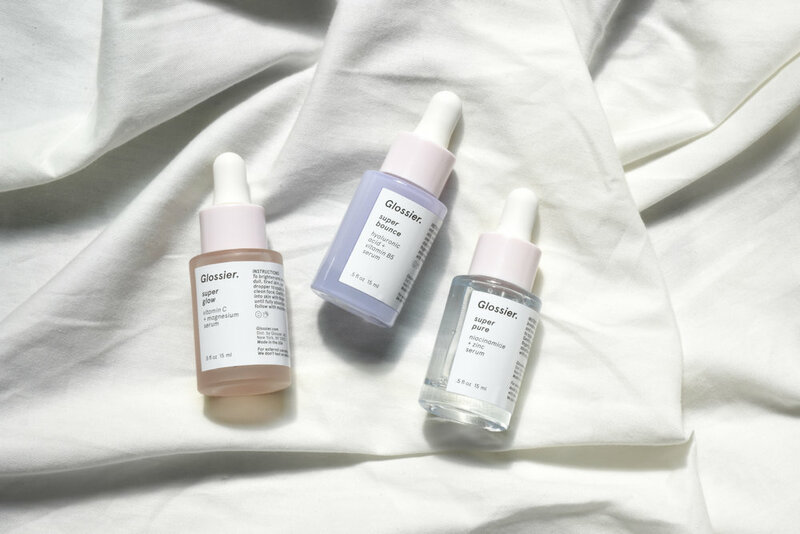 A couple of months ago, beauty blog Into The Gloss announced that their beauty company Glossier has launched The Supers - a pack of three serums that can be mixed and matched to suit the condition of your skin, as well as to assist you with whatever issues your skin can pull on you. I must say that what got to me was the hype surrounding the product. Suddenly, it seemed as though every known personality I follow on my Instagram was talking about The Supers and the sponsored ads were seen on every social media platform possible. Now, Glossier did not do international shipping out of the US (Ok, only to Puerto Rico or something, but who cares?) back then and it was only recently that they announced "International shipping" to... Canada (Really? *cue me rolling eyes*). Anyway, the fact that I couldn't get my hands on it made them even more desirable. Plus, the whole packaging and branding colours really appealed to me. Apparently, as one of my closest friends pointed out, I've fallen into the "Millennial trap". Whatever. I was very determined to try these serums out. So, when THE FIFTH COLLECTION's beauty-addict Nejla announced that she's ordering some Glossier products to try out and having it brought back to Singapore through a good friend, I pounced on the chance. Thus far, I've tried the serums for close to a month now and decided to share my experience with all of you. But before I continue, I thought I'd give a TL;DR version of what a serum is. Basically, a serum is a skincare product that you apply after cleansing your skin. It's a concentrated liquid formula that's packed with a concoction of active ingredients. It is supposed to penetrate through your skin and "treat" it. It's akin to health supplement... but for your face. Ok, now that we've got that out of the way... Here's my pretty honest review of The Supers by Glossier. I must say the packaging really appealed to me. It was simple and clean, mostly white and pink (ok, maybe I am a millennial. heh). The Supers pack contains three boxes of individually packed serums: Super Pure, Super Bounce, and Super Glow. Taking the serums out of the individual boxes, I was happy to see that the serum is packed in frosted bottles. As any skincare addict will tell you, active ingredients, such as Vitamin C and Zinc, found in these sort of skincare products must be kept away from sunlight. Each of the bottles are slightly tinted as well, so they're quite pretty to look at. See the picture right at the top of this article for image reference. Anyway, each bottle comes with an attached dropper (of course), and are devoid of any crazy designs. Only a simple instruction and a short write up of the serum's "promise". Ok, so I'm not really great with all these ingredients and what they are. If you want the full ingredients list, you can head over to the Glossier site for them. I mean, unless you're a chemist or a lab technician, how do you know what "Phenoxyethanol" or "Peg-20 Methyl Glucose Sesquistearate" even mean? Seriously, they could have put the entire Periodic Table from start to finish and I would be none the wiser. If I was never interested back then, I won't be interested now. Heh. However, as much as I'm a chemistry-noob, I do know certain important ingredients when it comes to skincare. I mean, that's all you need to know, right? Do these products contain specific active ingredient so as to combat specific skin issues you have? With that in mind, I've done the TL;DR version of the ingredients list, which, if you ask me, is much better. - Hyaluronic Acid, which is a natural substance in our body which has anti-aging qualities and restore as well as repairs your skin from the inside. Basically, it plumps up your skin from the inside out to give you that “bounce” (thus the name of this serum!). - Vitamin B5, which is a member of the powerful B-complex family, is super hydrating and acts as a moisturiser to keep the skin soft and moist. - Niacinamide, which essentially is Vitamin B3. Basically, niacinamide boosts the immunity of the skin and improve redness as well as blotchiness of the skin. - Zinc PCA helps to clear out impurities and excess sebum that can cause pimples and blemishes. It also helps to decrease the redness and irritation caused by acne. - Vitamin C, which has anti-oxidant properties that helps prevent and treat UV and sun-induced damage from the sun. It also helps reduce dark spots, while creating a smoother, light-reflective skin. - Magnesium PCA, which occurs naturally in the body and has the natural moisturising factors. What it claims to do: Plumps up skin, thanks to the Hyaluronic Acid, as well as restore your skin's elasticity so you will have that dewy, "bouncy", and supple feel to your skin. I like this one. Basically, I'm always in the A/C and I sleep with the A/C blasting in my direction so my skin does get a bit dry. I also like that this serum has a milky consistency and so it doesn't run all over my face like the other ones do. It does what it says it does. My skin does look hydrated and doesn't feel rough or patchy. Not too bad. Despite the thick consistency of the serum, it's not sticky when applied onto the skin. In fact, my skin feels rather silky smooth. What it claims to do: The blend of niacinamide and zinc is supposed to be great for your acne-prone skin as it calms the skin down and soothes redness. I must say this was the one that left me feeling meh. So, I've been travelling quite a bit and my skin has been under a bit of stress. So, I can sense a breakout about to happen and that's when I started applying this super lightweight serum onto the different spots. The noob me thought that it will clear the blemish overnight. Apparently, that's not what it does -- well, at least not to me. However, the Super Pure serum did stop the blemish from growing into a full-blown zit. So, that much, I'm happy and thankful for. I've been using it every night before bed and it's been a week since. The blemish is still there but it's not a pimple. So, i guess I'm good with it. Will I buy this separately once it has finished? Maybe not. I mean there are other better products out there and one that is easily accessible. Good thing is that you don't have to apply this serum all over your face. Just to the spots you know are prone to blemishes and breakouts. What it claims to do: Basically, brighten and energise your skin. You're supposed to be able to have a late night and wake up, walk into the office and still look like you've had ample amount of water and a full 8-hours worth of sleep. I have to admit that I was most excited to try this out. I always sleep late and I wake up too early. It's just how my body functions and it's taken a toll on my skin. So, sometimes, I do look exceptionally tired and my skin looks dull. This one's supposed to give me that boost! I tried it, and loved it. The first morning I tried it, my skin did look brighter - not dull, or tired. And then the true test came. I attended an epic three-day wedding in Penang and that was late night after late night. Three consecutive late nights in general. And I still have to look presentable and impossibly fresh at the different events. So I applied this without fail each morning and it was like magic. Of course, I did apply the Super Bounce before I sleep, so I guess the combination worked swimmingly together. Will I buy this again? YES. So, overall, I think Glossier's The Supers generally do what they promise. Each of them comes in pretty minimalist-chic bottles and if you buy this as a pack instead of individually, you'll be saving about US$20. I definitely recommend Super Bounce and Super Glow (Glow > Bounce, of course, but both together works great!). But are they worth the hassle of finding someone in the US to bring this back for you? Perhaps not. There are others around that are easily accessible. Maybe not as affordable (serums are known to be expensive) but they do the job well anyway.